We don't like to beat around the bush, or the bodily organs, when it comes to our precious pets. Kidney (renal) failure is something you should know about because there is gradual loss of kidney function in all pets (and people) as they age. It's not an awesome subject, but second to arthritis and cancer in pets, chronic renal failure is the most common illness in elderly cats and dogs. Chronic Renal Failure (CRF): This is the most common type of kidney disease found in pets and your growing-old-gracefully tabby is most at risk. It can become a problem over time and homeostasis (maintaining internal stability) makes it difficult to (self) diagnose. That's why [important notice ahead] any pet over the age of 7 needs to have two annual blood and urine tests a year, so CRF is detected and we can keep the skip in Skippy's step with early treatment if necessary. Acute Renal Failure (ARF): Less common. More serious. ARF is when there is a rapid decline in kidney function because of infection or poisoning. Treatment is usually with fluids via a drip, but, sorry to say, prognosis is not good. Kidney infection (which can include kidney stones). Amyloidosis (high deposits of a certain type of protein in the kidney). Drinking more water than usual, and probably a lot of it. More peeing, a lot of it. Low blood-count (check redness of gums). Tired (from low blood-iron and potassium). Signs of AKD will be similar but more, well, acute ~ usually a quick and dramatic onset of the symptoms above. And there's really no time to "wait and see" because your most precious possession needs veterinary attention right away. CKD can be treated but not cured. 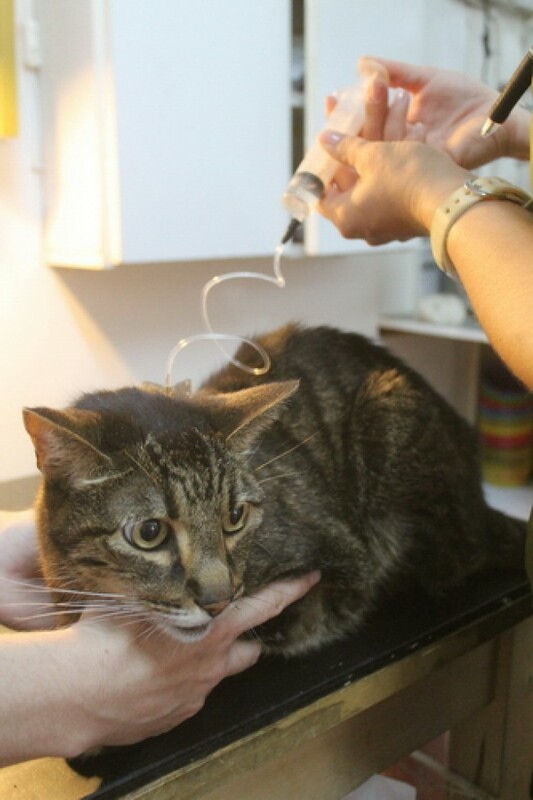 Your vet will design a regime depending on how severe the disease is, but the general big picture is to try to relieve the kidneys from all the stress they're under. Other diet additions: On your vet's recommendation, supplements like Omega-3 fatty acids, B-vitamins and antioxidants, can be added to boost kidney function. Water: Plenty of fresh water must always be on-tap ~ very important to prevent dehydration. Medications: You need to have a degree in Veterinary Medicine (and if you do, we want you!) to understand the different levels of CKD and the treatments required at each stage, so let your vet do the diagnosing and you do the vigilance, health maintenance and good pet-lovin'. Our last word is about stress. The less of it the better. To keep your tangerine tabby's life tension-free really means that she needs a calm parent. Like any chronic disease, CKD needs careful management but also flexibility when things change. You're going to need some sturdy inner resources, so please look after yourself too!